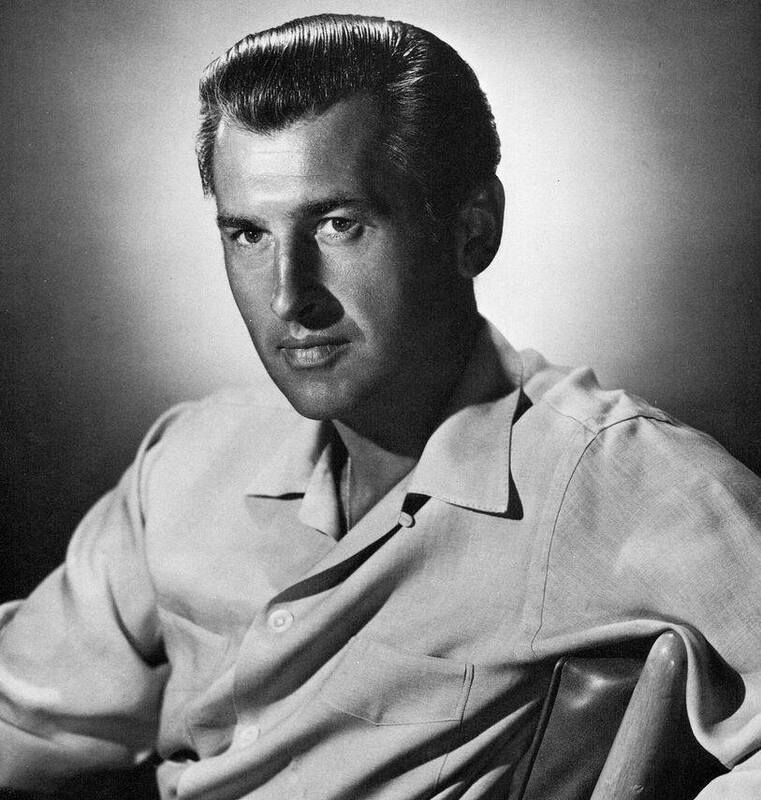 Actor Stewart Granger is once again the focus here at Mike’s Take thanks to the time taken by Maddy Who Loves Her Classic Films. 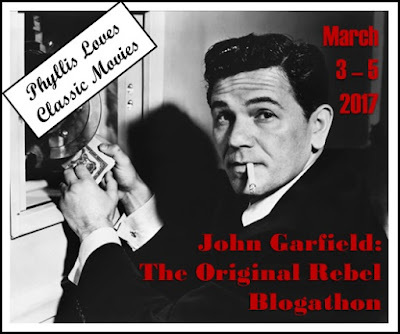 She’s put together a blogathon to feature the one time Jimmy Stewart (Granger’s real name for those unaware) so we can all look back revisiting some of his many movie characters throughout his lengthy career. 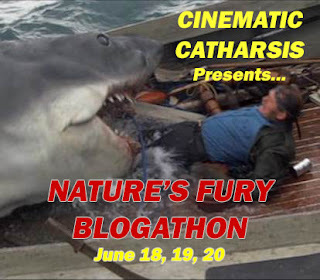 I’ve settled on this Roger Corman …. yes I did say Roger Corman WW2 tale that one might even argue is the best cast ever assembled for a non horror film from one of moviedom’s most prolific director/producers. In Corman’s autobiography he recounts that this was his first film for a major studio and at hand was a budget twice the size he was accustomed to coming it at $600K. The tale is a simple one that we could argue takes it’s inspiration from The Guns of Navarone but it’s also interesting to note that it beats The Dirty Dozen to the screen by three years. 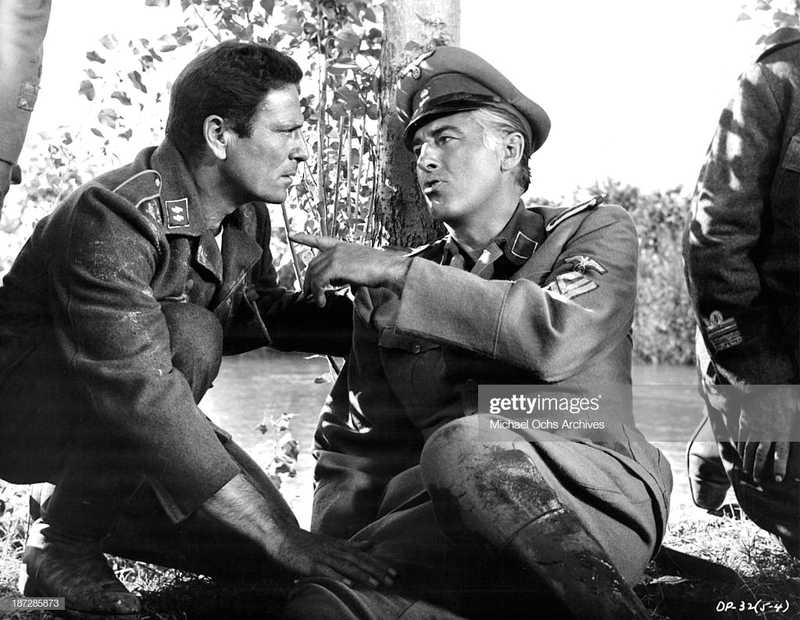 I say this because in our story we find Stewart Granger as an officer who has five criminals assigned to him for a top secret suicide mission in Germany occupied Dubrovnik. The men under Granger’s command are to meet with the underground forces and free an imprisoned Italian General who is expected to rally his people forcing the Germans to deploy more troops to this area thus thinning the forces in Normandy for the impending invasion. Under Granger’s command are a demolition expert played by the feisty Mickey Rooney, a stone cold killer played by the perfectly suited Henry Silva, a pair of American criminals, Edd Byrnes and William Campbell and Raf Vallone who will be returning to his own homeland. As is the custom in these men on a mission tales, there will be a brief training session where Granger will prevent the boys from making an escape but, “God help you if you try that on the mission.” Now that we’ve got that out of the way, Vallone’s clearly proving to be the loyal member of the group to Granger’s cause. Once they make their way to Dubrovnik following a gun battle with a German patrol boat, it’s Vallone who will step into the role of second in command with Granger’s blessing. This is how Silva is referred to by the film’s leading lady and resistance fighter Spela Rozin billed here as Mia Massini. The relationship that will develop between Silva and Massini is one that might surprise you on a first time viewing assuming you know Silva to be a man of stone thanks to him portraying just that in dozens of feature films in both North America and abroad. Granger continues to drive the men and Campbell and Byrnes are not exactly waving the patriotic flag to give their lives to the cause. It’s at this point that Granger will admit that his main reason for taking on this mission to free a General from a Nazi prison is that his own brother was tortured and killed within the prison walls by the sadistic commander, Helmo Kindermann. When the group are betrayed they’ll find themselves cornered and with little hope of survival they surrender which results in them being caged within those same prison walls. And so the plotting to escape with the captured General begins. Like the majority of men on a mission war time adventures, don’t expect each and every freedom fighter to make it to the final credits. Here under Corman’s direction there is going to be plenty of fireworks and machine gun fire over the final third of the film following the groups torturous stay within the prison. 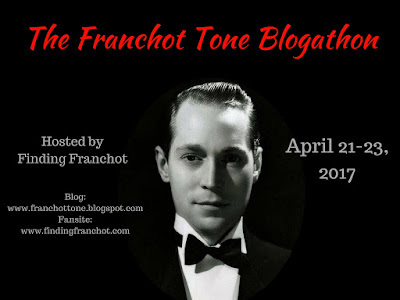 Roger’s brother Gene served as the producer on location in Yugoslavia and a keen eye should spot Charles B. Griffith’s name in the credits as the Assistant Director on the film. Griffith can be spotted on numerous Roger Corman projects from writer (Not of This Earth, Bucket of Blood, Death Race 2000) to directing Eat My Dust with Roger producing. Granger by this time was no longer the swashbuckling hero over at MGM but was well suited to a military officer who commanded respect and barked orders on screen. 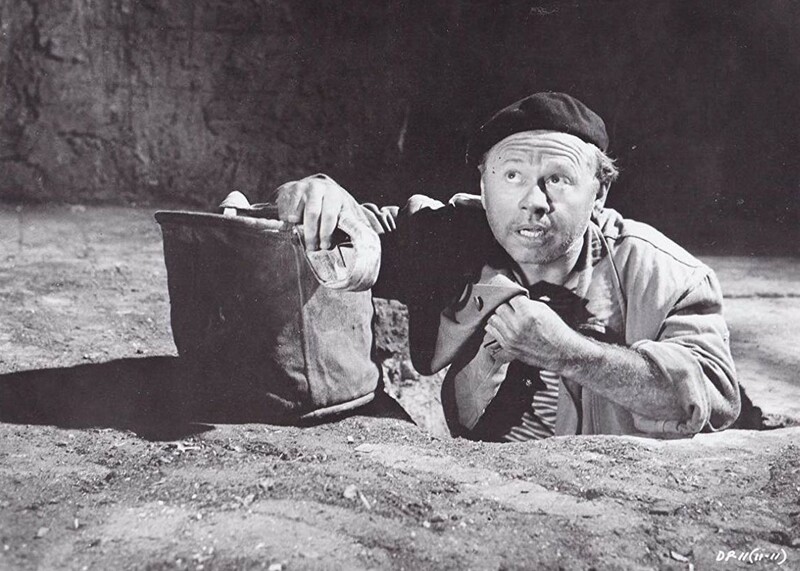 Alongside him we shouldn’t be surprised to see Mickey Rooney playing scene stealer as a fireball on the battlefield with a penchant for women and whiskey. 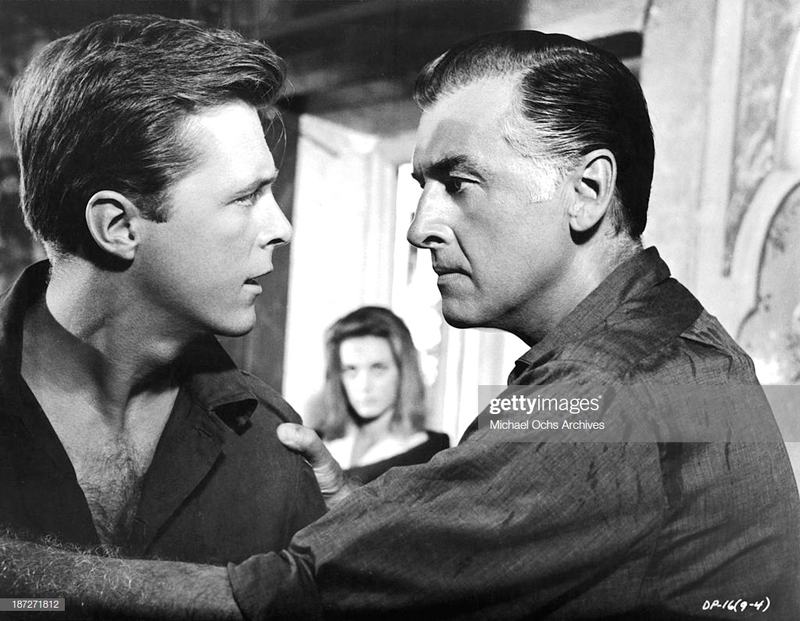 Silva surprises, Campbell was past his young gunslinger roles and had become a Corman regular (The Young Racers, Dementia 13) and Edd Byrnes was coming off his successful run on TV’s 77 Sunset Strip. Truly it’s Raf Vallone who shines the brightest next to Granger’s leading role. He comes off as the most level headed of the group and delivers a very fine performance here as a man looking for redemption in his homeland. I’ve seen very few films with Mr. Vallone aside from the usual suspects like The Italian Job and others where he isn’t the lead so if I’m missing a foreign film that he shines in please feel free to comment below. Going back to Corman’s book, How I Made a Hundred Movies In Hollywood and Never Lost a Dime, there’s an amusing story he relates of Granger and Byrnes shooting a scene late into the night where maybe Granger’s ego got the best of him concerning a line in the script that he wanted as opposed to Byrnes delivering it as the script had it written. An amusing tidbit from the movie sets of yesteryear. 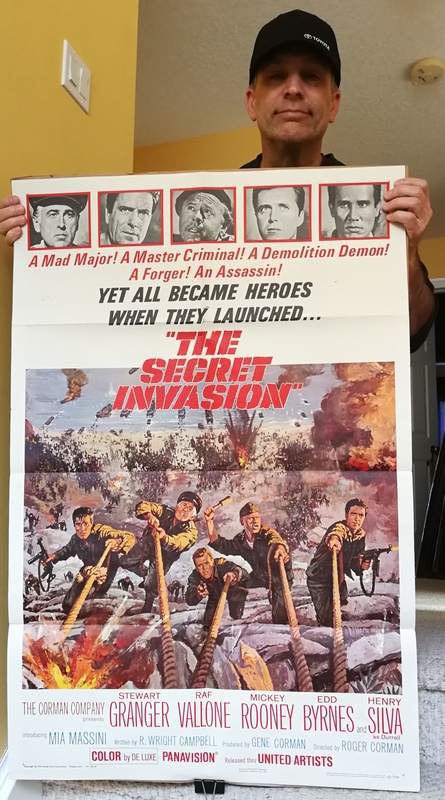 Easy to pick up on blu ray or DVD this is an easy title to recommend as is this gorgeous one sheet should you be fortunate enough to come across it in your hunt for classic movie memorabilia. 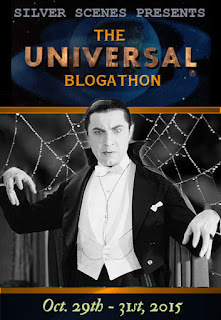 Now be sure to check with Maddy to see what other Granger films are being featured and please follow the links to the other fine folks who have joined in to give us their “take” on the many projects that Jimmy Stewart…. I mean Stewart Granger undertook to keep us all entertained from the 1940’s on. An entertaining movie no doubt! Granger, Rooney, Vallone and Silva shine as expected. Would rate it below The Guns Of Navarone and Where Eagles Dare. Best regards. For sure, it lacks the big budget splendor of those but had it had the bigger budget and reworked by someone other than Corman, who knows. I’m trying to remember if I’ve seen this one. If not, I certainly should. Anything with Stewart Granger can’t be bad, I say. And I’ve just lost my heart to Mia Massini/Spela Rozin. It’s a worthy addition to the pile of WW2 flicks from the era and better than some. Just a notch below the big budget efforts but has a solid cast to keep it atop the lesser ones of the genre. If I am not mistaken Mia Massini acted opposite Rory Calhoun in that entertaining and exiciting sword and sandal film Colossus of Rhodes in the early Sixties. Oops. Above mixed up with Lea Messari of Colossus of Rhodes. My apologies. Guess I don’t have to go double checking on that Rory flick that I saw years ago and I would imagine now holds a place in movie history as Sergio Leone’s debut. Raf Vallone was also solid in “El Cid”,”The Cardinal”, “Nevada Smith”,”Cannon For Cordoba” and “The Godfather III”. Can’t speak to his native Italian films, where he’s no doubt impressive. Cool poster. As I say, the usual suspects though I’ve still got Cordoba on my list to get to. Have the blu ray so been eyeing it up. Also saw him in A Gunfight but again a secondary role. It’s a worthy poster to have framed if I had the wall space. This sounds like fun. I can see Stewart Granger fitting this role perfectly, he always had an air of authority and strength about him. Cool poster! He was the right age to be a commander by this time and fits the role nicely. As always thanks for taking the top to host. Wow! The title didn’t ring any bells and I know I haven’t seen The Secret Invasion, but now I must. Having recently rewatched The Dirty Dozen I am most anxious to see this tidy ensemble going through their paces for Corman. Thanks for introducing me to this movie. what’s kind of funny is you’d assume this was a Dirty Dozen knock off from Corman who pretty much cashed in on any trend during his many years of exploitation filmmaking but not the case here as this was out first. I’ve seen this a few times and find it enjoyable overall. Have fun. You’re right, that IS one very cool one-sheet poster! Never heard of this one, and I’m surprised to see Corman directed a big-budget NON-horror film! 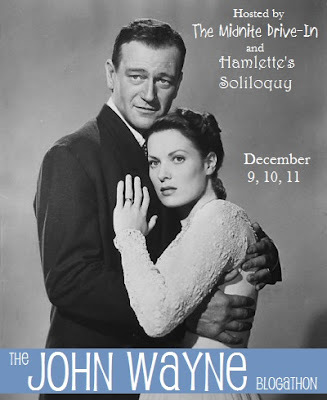 And now, I can’t think of ‘It’s a Wonderful Life’ without seeing Granger in the role! Well he really is Jimmy Stewart in a parallel universe. Good movie matched by that one sheet. Great review! I didn’t know this movie and what you wrote about The dirty dozen intrigued me! It’s a small piece of plot detail but it’s so obvious considering the popularity of the Dozen and again one would assume that Corman would borrow that idea but in this case he didn’t. At least not from the movie and I just checked on the novel’s publication date and that was 1965 so it would appear as if Corman is first.